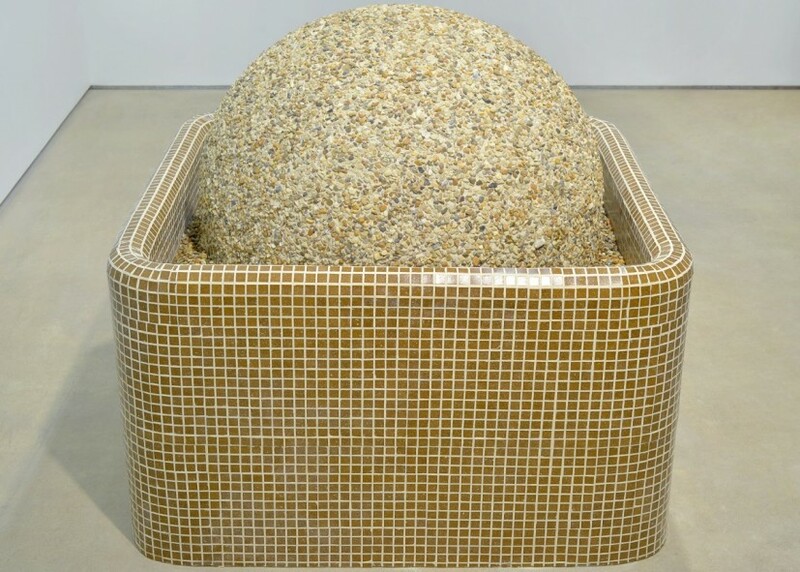 Rachael Champion, Primary Producers, 2014, mixed media, Perm Gold pebble dash, fresh water wild algae, 386 x 510 x 893cm. Image courtesy Hales Gallery, London, © the artist. 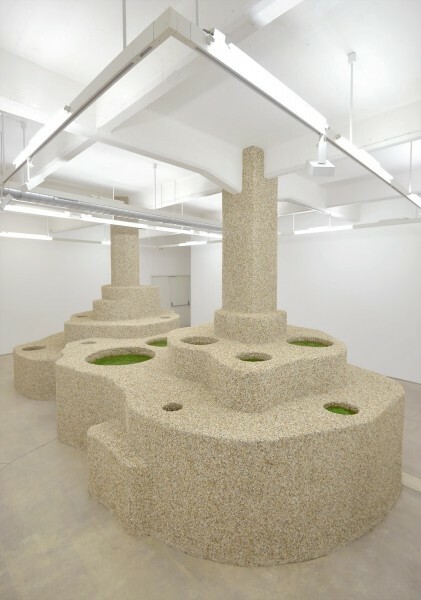 Rachael Champion, Primary Producers, 2014, mixed media, Perm Gold pebble dash, fresh water wild algae, 386 x 510 x 893 cm. Image courtesy Hales Gallery, London, © the artist. Rachael Champion, Brutalist Structure, 2013, plywood, timber, mosaic tiles, plastic dome, tile adhesive, pea shingle, 120 x 120 x 101cm. Image courtesy Hales Gallery, London, © the artist. 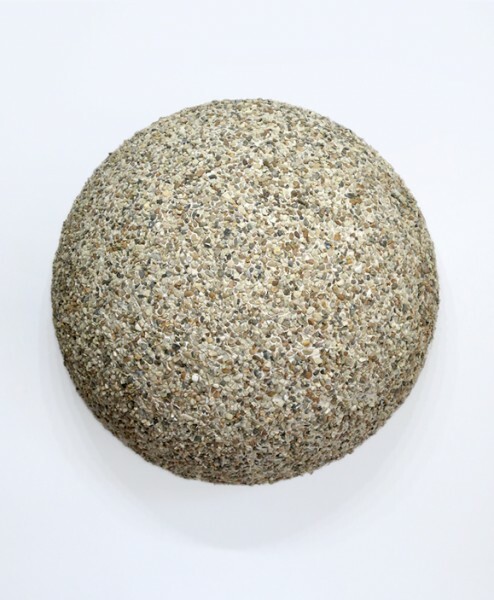 Rachael Champion, Brutalist Body, 2013, 88cm x 45cm, plastic dome, tile adhesive, pea shingle. Image courtesy Hales Gallery, London, © the artist. Rachael Champion is another noteworthy alumnus of the Royal Academy schools and her first solo show at Hales Gallery in the Tea Building near Liverpool Street Station is an opportunity to get a handle on an artist who is steadily growing a serious profile. Just four years out from the RA she has already shown at Modern Art Oxford and Bold Tendencies, as well as being artist in residence at Camden Arts Centre in 2012. 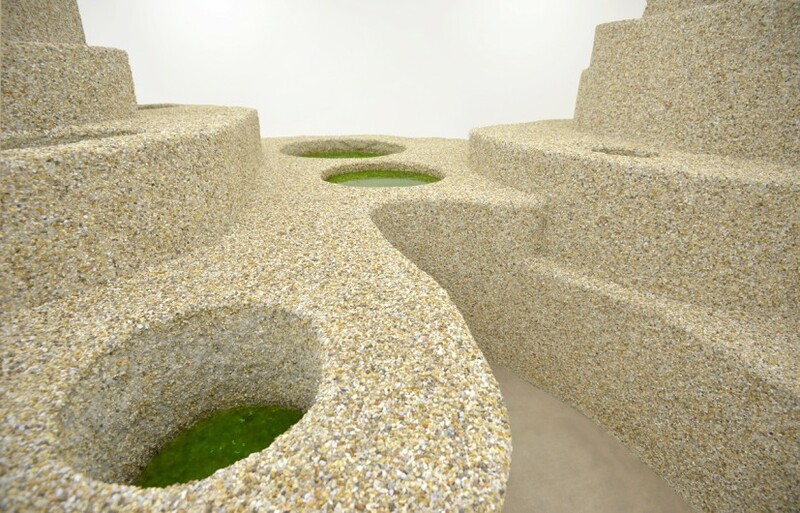 Through projects such as last year’s House 3 exhibition at 2 Lonsdale Road in Notting Hill, what has emerged as the artist’s “signature” material is pebble dash. An erstwhile symbol of low-cost architectural fudging and redolent of a peculiarly British petit bourgeois suburban taste, pebble dash was, I suppose, ripe for a reinvention. Champion makes this material work hard for her, using it to evoke thoughts about our use of natural materials in the built environment, and what in fact constitutes a cheap material when it is drawn from non-renewable sources. The very large-scale sculpture, Primary Producers, which inhabits the whole of the main gallery, is an architectural form reminiscent of the more progressive play structures for children that were popular in the 1970s, or a skater-proof city centre streetscape. 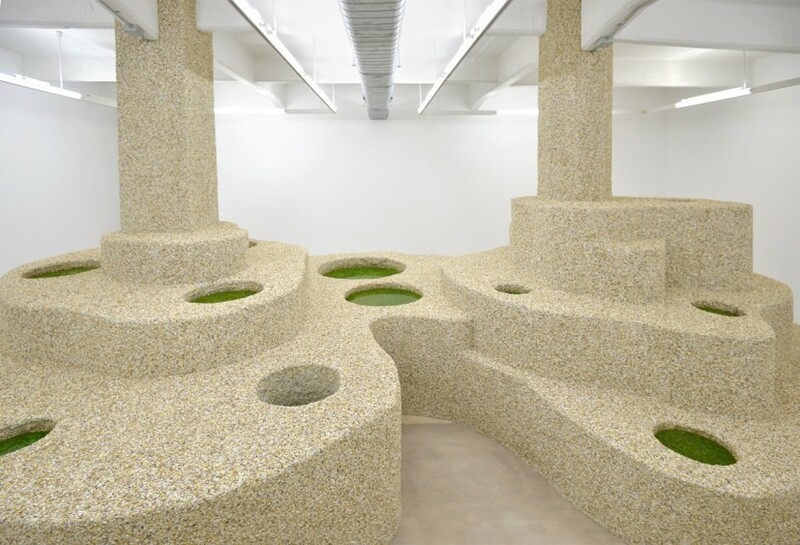 Embedded in the structure are shallow circular pools each hosting a bloom of fresh water wild algae. The algae is one that can be used for biofuel as well as being researched for health benefits. Together this restricted range of materials speaks of pro-active and optimistic strategies to address contemporary environmental concerns. Out in the corridor you will see a smaller, wall-based work called Mountain Flattening Initiative, 2014 (this gets the prize for my favourite title of the year, incidentally). The work employs the other material that Champion uses again and again: glass mosaic tiles, familiar from a million and one bathrooms and swimming pools as well as utilitarian civic architecture. This interest in the infrastructural, and repurposing of the least demonstrative of low-grade decorative elements within an new idiom has a toughness to it that is very appealing and saves the work from appearing mannered or merely formalist. 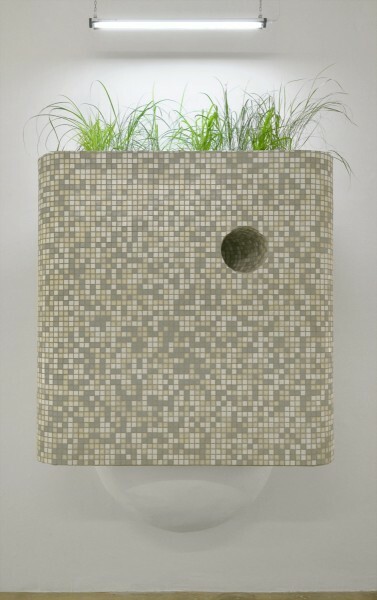 The tiled form, sitting atop a white rendered domed shape, has strange apertures, vents or chutes for which it is hard to imagine a function, and the whole is crowned with a tousled crop of tall green grasses. Rachael Champion is American by birth and it is fantastic to see that, in spite of the appalling cost of living and working in London, we are still able to attract young artists of this calibre who come to study and then stay on. Make sure you don’t miss this.